‘Typed note’ just has to be one of my favourite stamp sets EVER! (And I know someone else who feels the same way (Lisa)!! Not only because it looks so cool, can be used for so many occasions with all the sentiments it has, but also because it reminds me of how I started my business life. Many many years ago, I left paid employment as a PR consultant, to start my own secretarial service. I had learned to type on a typewriter, but at the time I started my business, I was one of the only in my profession using a computer! (I know, I’ve really dated myself now, there’s no going back!) Isn’t hard to believe how much technology has changed in what’s not even a lifetime. I do wish I’d kept my typewriter now, because it really is such a classic piece of history. But I’ve digressed. 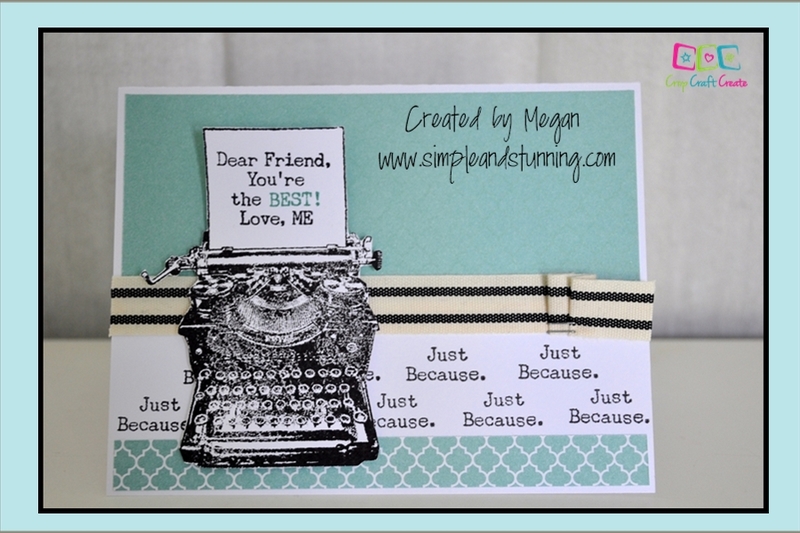 I have very quickly made this card, which will be part of our Card Creations class on the 15th. It uses Typed Note (obviously), Fundamentals paper (which is just the coolest), Black Striped Twill ribbon, and the Mini Stapler. I’ve used masking to highlight the ‘best’, which I’ve inked in the matching Juniper. You can purchased Typed Note for $33, or with an order of $75 or more in April, you can purchase Typed Note for just $5.